Weapons Amnesty trounced a high-class field to win the RSA Chase for owner Michael O’Leary, trainer Charles Byrnes and jockey Davy Russell. O’Leary’s horse won last year’s Albert Bartlett Hurdle to complement victory in the 2006 totesport Gold Cup by War Of Attrition, who is also owned by the head of Ryanair. Byrnes said: “It was an unbelievable round of jumping, but we had by far the most experienced horse coming here. He has already contested two competitive Grade Ones so you could almost call him a handicapper against novices. “Davy was brilliant and switched him off completely and it’s a great team to have a winner for. I believe in horses for courses and this horse likes Cheltenham. I’m shocked by the ease of his win, but I knew he’d put in an improved performance compared to his last two runs at Leopardstown, simply because he’s a course winner and also the better ground. He would have won his previous race over another half mile. Next year’s totesport Gold Cup is now on Weapons Amnesty’s agenda, and he was quoted at 8-1 by Ladbrokes and 10-1 by William Hill for the 2011 running. It was 9/1 chance Burton Port, the outsider of trainer Nicky Henderson’s three RSA Chase runners, who finished best in the contest when coming second to Weapon’s Amnesty. Burton Port just pipped stablemate Long Run (11/4), who finished third, while the 2/1 favourite Punchestowns could finish only fifth. “They’ve all run good races but we got beat and they’ll be back next year, a year stronger,” said Henderson. “We didn’t expect Burton Port to finish first of the three but he ran and a storming race and if we hadn’t had the other two we’d have fancied our chances,” said Henderson. “It almost looked with Long Run that he didn’t stay. He jumped OK but just nudged a couple and we’ll have to iron those kinks out. He’s only five so we’re in no rush with him now. “Punchestowns cannot have been quite right. He lost a shoe from the foot that was giving him a problem at some point in the race and Barry (Geraghty) wasn’t sure when. Knockara Beau was narrowly pipped for third place by Long Run but his trainer George Charlton was delighted by the performance of the fourth. “It was a fantastic run, he was unlucky when he made a mistake at the third last and he went from third position to last but was running on at the finish. He didn’t half quicken,” said Charlton. “He just needs to get his jumping together and when he does that he’s going to be top-class. “There had been a lot of talk about Long Run but we’re just a bunch of farmers from Northumberland and we almost beat him. Robert Waley-Cohen, owner of third-placed Long Run, felt that the five-year-old may have struggled to last out the three miles and half a furlong of the RSA Chase. “I thought he didn’t quite stay the trip, he just didn’t really come up the hill very well. He didn’t come up the hill like he stayed. Working out his trip is quite tricky; two and a half at Cheltenham would be ideal, but there isn’t one. I think Kempton over three miles would be perfect, roll on December 26th,” he said. The owner also used the occasion to highlight the discrepancy between allowances in Britain and Ireland. “Because the weights’ allowance for five-year-olds has been cut and it’s now only one pound - as a matter of interest, if he was running in the Grade One in Ireland, at Punchestown, he would be receiving nine pounds. I don’t know which is the right one, but they can’t both be right,” he said. His son, Sam Waley-Cohen, who rode the French-bred said: “I just felt that to get him jumping I was just going to have to ask him into one. Just to give him the confidence to keep going. And that’s the trouble with this course, you have to have the versatility to settle or ask. Diamond Harry, the 5/1 third favourite, disappointed trainer Nick Williams when pulled up in the Grade One RSA Chase. The seven-year-old was never travelling with any fluency and could not get into the race. Williams said: “He was just very disappointing today. I don’t know why, but we haven’t seen the real Diamond Harry today. Williams fared better in the previous race, the Grade One Neptune Investment Management Novices’ Hurdle, in which his Reve De Sivola finished the length and a half runner-up behind Peddlers Cross. Williams continued: “I was very happy with Reve De Sivola’s performance although I am obviously also disappointed as I deeply wanted to win. Citizen Vic unfortunately was fatally injured when he fell at the second last in the RSA Chase. 1. The RSA Chase is run with its current title for the second time this year although is backed by one of Cheltenham’s longest-running sponsors. It was run as the Royal & SunAlliance Chase up to 2008 and as the Royal SunAlliance Chase in 1997. 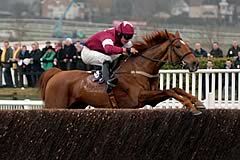 Sun Alliance, which merged with Royal Insurance in 1996, previously backed the Sun Alliance Chase for 23 years and sponsored at Cheltenham for 26 years altogether. From 1971-73, the Foxhunter Chase was titled the Sun Alliance & London Foxhunters. To this list might be added the name of Tied Cottage, winner of the RSA Chase in 1976 and the Gold Cup in 1980, before subsequent disqualification. 4. The biggest field for the race has been 30, in 1986, and the smallest eight, in 1993. The current safety limit is 20. 5. Willie Mullins has the best record among current trainers in the contest, having landed three victories with Rule Supreme (2004), Florida Pearl (1998) and Cooldine (2009). Legendary handler Fred Winter also saddled three winners of the RSA Chase - Killiney (1973), Pengrail (1975) and Brown Chamberlin (1982). 6. Irish-trained winners number 14 in total, the latest being Cooldine in 2009. 7. The most successful jockey in the RSA Chase has been Peter Scudamore, who notched up a hat-trick from 1991 to 1993 with Rolling Ball, Miinnehoma and Young Hustler. Ruby Walsh is the only current jockey to have landed the race twice, having won on Denman (2007) and Cooldine (2009). 8. The longest-priced winners since 1964 are Hussard Collonges in 2002 and Canny Danny in 1983, both at 33/1, with Arkle the shortest-priced at 4/9 in 1963. 9. The fastest running of the race was won by Lord Noelie in 2000 at 6 mins 5.3s, beating the previous best of 6 mins 6.6s set by Miinnehoma in 1992. 10. The West Awake is the only horse to have won both what is now the Neptune Investment Managment Novices’ Hurdle (previously sponsored by RSA) and the RSA Chase. He won the Hurdle in 1987 and the Chase in 1988.